Part 11: I have a basic will, is there more I should know? I have a basic will, is there more I should know? This article should be read in conjunction with our article Who can my super go to and will they pay tax? to understand the basics of estate planning around super. Having a will is critical to making sure that the right people receive your money when you pass away without any surprises. Many people set up a basic will with the public trustee or a will kit that very basically says give all of my money (and assets) to my spouse and/or children upon my death. While this creates more certainty of who will receive the deceased’s money upon death, it does not provide any certainty on what happens after that. Before setting up your will you should consider your beneficiaries long-term needs and potentially consider a Testamentary Trust. Joint names – Firstly, you need to understand that assets that you own in joint names with your spouse will not be dealt with by your will, they will pass to your spouse directly upon your death and therefore not form part of your estate. Own name – Assets that you own in your personal name will form part of your estate and be handled by your will. Most people through their will ask that 100% of their assets go to their surviving spouse. This results in these assets now being owned in the spouses name and the income of these assets are taxable in the name of the spouse. This could result in your spouses overall financial position after tax being much worse off than when you were alive even though the same amount of assets are owned by the family. An alternative to this is a Testamentary Trust. A Testamentary Trust is a trust created upon death through your will. A strategy that can be used is to have your assets pass to the testamentary trust rather than directly to your spouse or children. 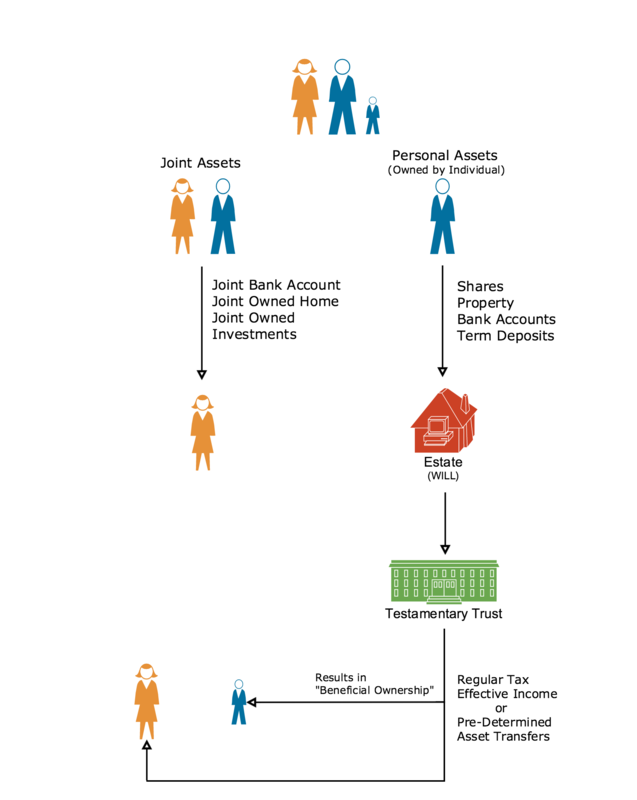 The income from the assets in the trust can be distributed to both the surviving spouse and child as a tax minimization strategy. Minor children who receive income from a Testamentary Trust can claim the tax free threshold on this income which as of the 2014/15 financial year is $18,200 pa. This can save a significant amount of tax over time, especially if your children are young or you have multiple children to distribute the income to. Your spouse and child do not physically own assets that you put into the Testamentary Trust, they are beneficial owners. This can be very useful as an asset protection strategy. For Example, the child might get married one day and then divorce. The assets in the Testamentary trust are not actually owned by the child so generally; the child’s former spouse cannot receive a portion of these assets in the divorce settlement. The same could apply to the surviving spouse if she were to re-marry one day. Another example is if the child has a disability. The assets can be held in the Trust and paid to the child over time to provide a regular income. If the mother were to pass away one day you would know that the trust still exists and it can continue to pay an income to the child. What if you have adult aged children? You may have independent children who are financially irresponsible or are in relationships that you are unhappy about. A Testamentary Trust is a good way of passing your assets along to them, but allow you to put in measures to protect them from themselves or protect them from others. Estate Planning is a highly complex area, but one that should not be ignored. There is also a LOT more to it than simply setting up a will to give your assets to your spouse/children. Sitting down and mapping out who you want your assets to go to, how you want them to receive them (income or capital) and how much tax they will pay when they receive them are critical aspects to consider before you consult a solicitor to have you will drawn up. Congratulations This is the final page of this training series! Now that you have a better understanding of retirement planning we would welcome the opportunity to chat with you.